On November 12, the Grange officially received national recognition for its outstanding community service project, one of only five in the United States to receive this honor. They reached this pinnacle by winning the State Competition against 59 other granges filing reports. From State Champs the report went to National, where it competed against reports from 35 other state granges. The National Grange began on Dec. 4, 1867 in Washington D.C. in the offices of the Department of Agriculture. It is the oldest national agricultural organization. Established after the Civil War, its goal was to unite private citizens in improving the economic and social position of the nation's farm population. The Grange was built around the community. Knowing that women and children were just as important to the existence of the farm as the man, women and youth 14-years or more are on equal terms with the men. The Grange is also the only national organization that does not have a separate auxiliary for the women or a separate youth club. Women can hold the title "president." There are even three women-only positions. Totoket Grange has existed for 95 of those 134 years. "We have spent 95 years helping our neighbors," said Grange President Marion Bradley, who became a member when she was 14. "The neighborhood has just gotten bigger." Neighbors always helped and kept an open eye out for one another. In Bradley's youth, the Grange met weekly. "It was a way for teenagers to 'socialize' each week," Bradley recalled. 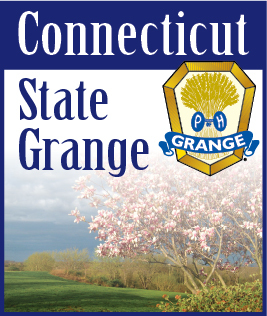 Today, the Grange meets regularly at the North Branford Hall, home of the community and senior center. Originally serving just North Branford, the Grange consolidated with the Guilford Grange two years ago. Community service is the main function. Totoket has many "pet projects." One of those projects is collecting books for the children at the Clinton Avenue School in New Haven, a sister school to Jerome Harrison. With the help of the community, 1,600 books were donated to the school last year. There is always something to do: an "adoption" of a local family at Christmas time; leaf recycling in both fall and spring; collecting food for both the North Branford and Guilford Food Pantries; donating a scholarship to the North Branford Scholarship Association; making and donating quilts and afghans to various charities; making several cash donation to charities; as well as spending hundreds of hours volunteering wherever there is a need. On November 13, not being able to contain their pride and excitement or wanting to wait for more "formal" celebrations, the Grange invited a few friends over to the Hall. The purpose, according to Bradley, was to "celebrate good neighbors, and new and old friends that helped us." Guests who helped the Grange in their endeavors were recognized before the regular meeting. Present to be thanked, receive a gift rose, and say a few words were Principal Patricia DeRenzo and Suzanne Goodison of Clinton Avenue School; Jerome Harrison Principal Robin Brown; Virginia Halstead and Jane Marshall of the Friends of the Guilford Library; Sandy Ruoff, Director of the Guilford Library; Pam Geri, Director of North Branford Recreation Department; and Patti Stewart, Editorial Assistant of the Branford Review. The evening resonated with the pleasures of extremely good food, stories of local "color," the introduction of special invited guests, and an oration of homespun poetry.